This has just about everything on it…Pepperoni, ham, ground chuck, bacon, Italian sausage, mushrooms, red onion, green pepper, banana peppers, black olives. Large weighs almost 4 pounds! Homemade marinara, fresh tomatoes, fresh mozzarella, aged balsamic reduction and fresh basil. The Big Kahuna Pizza – It’s a Luau Baby! Loads of pepperoni, ham, bacon, burger, sausage. Basil infused olive oil, pancetta bacon, capicolla, turkey, roasted red peppers, and red onions. House made diablo sauce, chicken,red onions, bacon, corn (yup – corn! ), and ham. 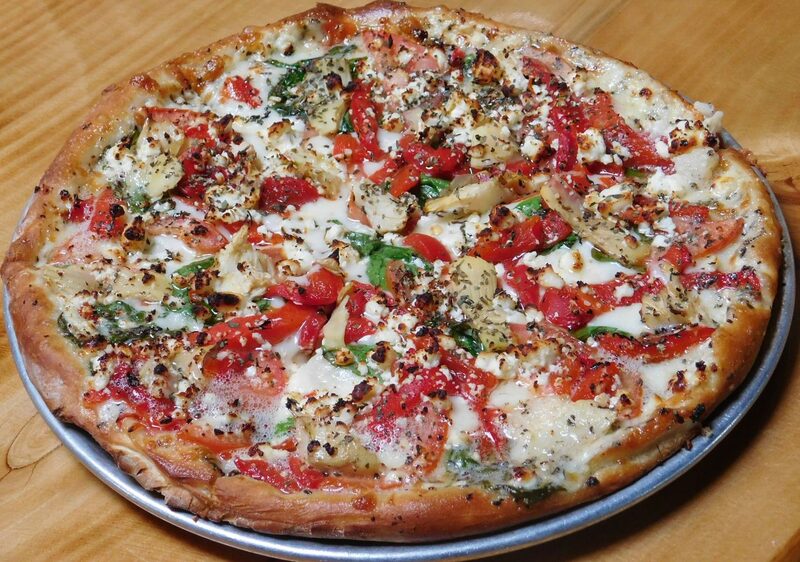 Basil infused olive oil, fresh spinach, roasted red peppers, artichoke hearts, tomato, feta, and basil. Basil pesto sauce, kalamata olives, red onions, chicken, feta, tomatoes, and pepperoncini’s. Pepperoni, Ground Chuck, Itialian Sausage, Bacon Ham, Meatball, Turkey, Anchovies. Pancette and Capicolla – Add $1 + item per size. Mushrooms, red Onions, Green Peppers, Tomatoes, Banana Peppers, Pineapples, Garlic, Green Olivces, Black Olivces, Corn, Fresh Spinach, Dried Cherries, Artichoke Hearts, Jalapenos, Roasted Red Peppers.